Solid hair shades are great and all, but sometimes, it can get a little boring... don't we all have our moments when we want to change things up?! Well getting Ombre or balayage hair is one of the most subtle ways to do that, while still seeing the difference. We say two is more fun than one. You can either go with a very subtle transition between the shades. If the two selected shades complement each other well, the Ombre effect will give more life and dimension to your hair. Especially when creating hairstyles, the Ombre portion will make the details stand out a lot more and make the hairstyle so much prettier. Even simple braids look so great with the colour transition. Have you ever wanted a change, but you were uncertain if it would suit you? 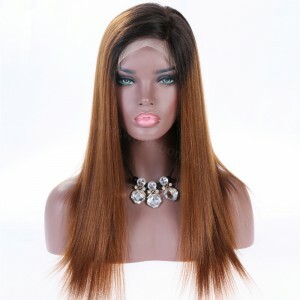 Omrbe color wig which has the root with color same with your own hair is great in this regard. It's literally just half the hair that you would be trying it out on, which is a baby step.